Friday the 13th is a day which fills many people with dread. Not me however. I was born on the 13th, not a Friday, but still on a date that most people consider unlucky. The ‘luck of the Irish’ keeps me balanced though no major disasters yet, tip wood (I never said I wasn’t totally superstitious). But on Friday the 13th, 2014, a certain type of fear was bubbling up inside me; the fear that The Fault In Our Stars movie would not be as good as the book. If you haven’t heard of The Fault In Our Stars by now you must be on another planet and I refuse to support your ignorance so you must go and find a synopsis yourself. Any TFIOS fanatics who have found me, welcome. I will save you the anticipation of waiting until the end of the post to let you know that it was truly awesome and totally in tune with the book. 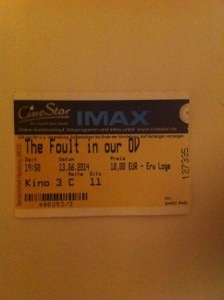 The actors played their parts well, especially Shailene Woodley who in my eyes was perfect. Ansel Elgort I was unsure of at first because he was not how I visualised Gus. I am always open to being wrong though and left the Sony Centre in Potsdamer Platz with a new actor crush. In all honesty, I could not name a single actor who I felt wasn’t fitting for the part. Highly recommend this cinema to expats in Berlin. Nothing that happened in the book was removed from the screenplay (at least as far as I could see). This was a relief as I felt that every part of the book was crucial. It made watching the film as entertaining as reading it and I really enjoyed seeing some of my favourite scenes being played out in front of my eyes. I could feel every bit of heartbreak with the characters and it was impossible to keep the tears in, for anybody in the cinema in fact. It was easy to identify the people who had already read the book as they began sniffling almost as soon as the film begun. At the same time, TFIOS had a lot of humour. Considering the storyline, it would have been hard to imagine the laugh out loud moments which occurred. It was such moments which helped certain minor characters (Hazel’s Mom and Isaac, for example) to come into their own. So, my overall verdict on TFIOS which I am sure you have already gathered from my above comments. Absolutely amazing! Fans of the book will not be disappointed, and those new to the story will want to run out and buy a copy straight away. I am still a bit angry with John Green for putting me through such a rollercoaster of emotions, but hats off to the man for producing a story as magical as this.